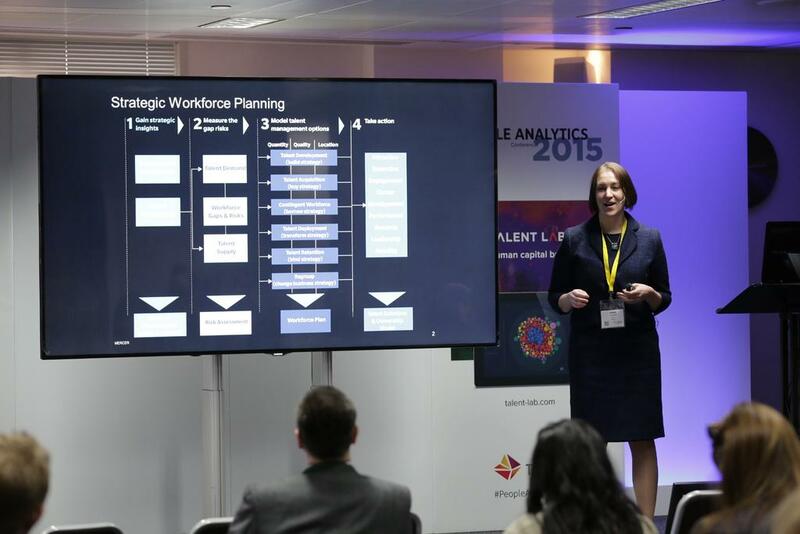 At the second day of the Tucana People Analytics conference, I attended a fascinating talk by Julia Howes of Mercer on Strategic Workforce Planning. According to Julia, huge changes are about to hit the economy in the next five to ten years, including the automation of many roles. At the same time, people are feeling more and more disengaged from their work. Demographic trends are also impacting the economy: with an ageing workforce and population requiring more services, Julia believes that, in the near future, more and more workers – especially women – will start working as carers. For successful Strategic Workforce Planning, Julia explained that ‘telling the story’ overrides most other considerations since without a story, no change will ever occur. 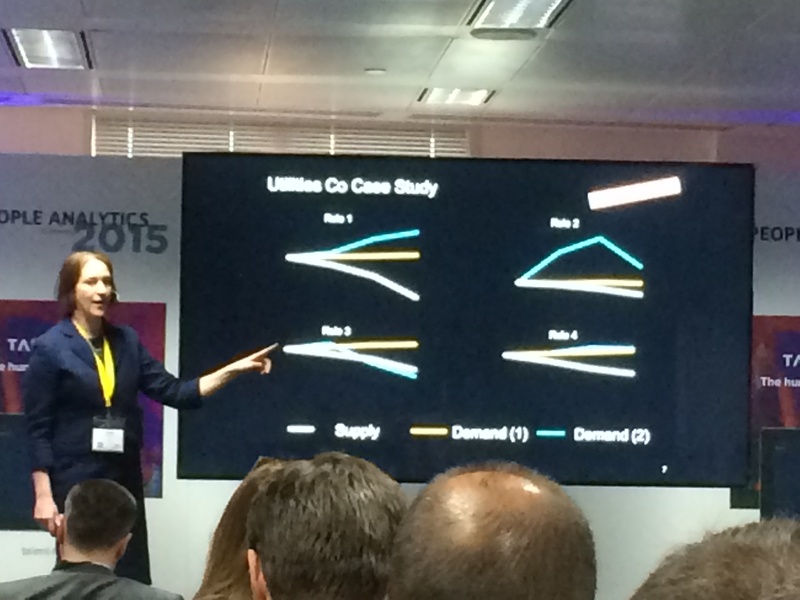 Julia gave a great example of this: visualising the future demand for 4 different roles in a business, she showed a slide without any axes or numbers on the level of demand (the photo didn’t turn out too well, but hopefully you can see the general trends). Her point was that workforce analytics can provide a sense of direction so that action can be taken, but precise numerical values are not always necessary. In fact, they can distract from the overall message. Julia explained that, when it comes to HR data, people are often afraid of using it if it’s not 100% accurate. Since it is practically impossible to have 100% accurate data, she advised that data doesn’t have to be complete to be good enough to give a sense of direction: as she said, “it’s not about 8 FTE or 9 FTE, it’s about taking the direction”. Organisation imperatives and Talent imperatives generate the Demand Scenarios for key workforce segments. Identify the roles that are critical to the business strategy over the next 5 years and focus on these. By extrapolating current trends, estimate Talent Demand and Talent Supply, calculate the gap and identify risks. Attraction, Retention, Engagement, Career Development, Performance, Rewards, Leadership and Mobility. I would then add a fifth crucial step to this process which is track. This is not simply a case of tracking headcount. Your headcount is simply your input into your workforce. The key is to connect this to business outputs and KPIs whether that be performance, sales scores or customer satisfaction. If you track, the first 4 steps become iterative, allowing you to hone your workforce over time and ensure plans evolve alongside your workforce.